Weld neck flanges have a neck that is welded directly to the pipe section. In comparison with other flange types, a weld neck flange can also be welded directly on a fitting. The inside diameter of the whole flange and outside diameter of the neck of the flange will match the in- and outside diameter of the pipe. 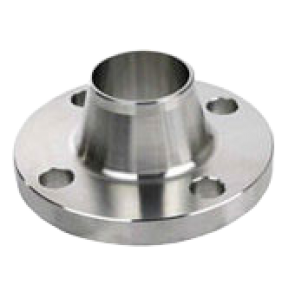 Weld neck flanges are often used in applications with high pressure. PipingMarket.eu can supply weld neck flanges in all material grades. Weld neck flanges from stock include ANSI B16.5, ASME B16.47 Series "A" , and ASME B16.47 Series "B" weld neck flanges. We also stock semi finished flanges and forgings to secure a short delivery time on special sizes and non standard flanges. Please Select ...1/2"3/4"1"1 1/4"1 1/2"2"2 1/2"3"3 1/2"4"5"6"8"10"12"14"16"18"20"22"24"26"28"30"32"34"36"38"40"42"44"46"48"50"52"54"56"58"60"